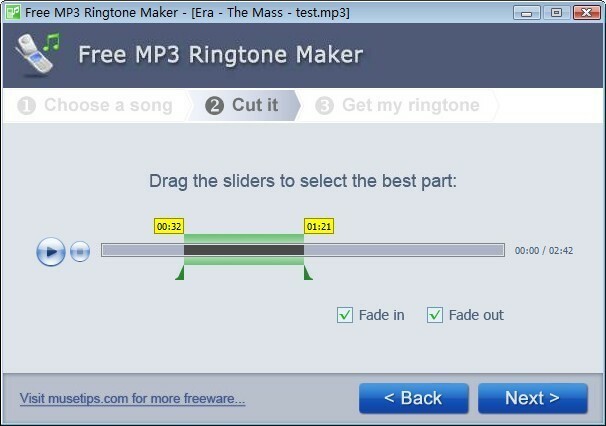 Free MP3 Ringtone Maker is an extremely simple and handy Windows software for making your own MP3 ringtones in 3 easy steps. Just pick a song, cut it by dragging a pair of sliders, and then you get your ringtone. Free MP3 Ringtone Maker is an extremely simple and handy Windows software for making your own MP3 ringtones in 3 easy steps. Just pick a song, cut it by dragging a pair of sliders, and then you get your ringtone. You can also add some fade-in and fade-out effects to the ringtone.